I made it to the finish line of the Fall 2015 One Room Challenge. It was a marathon and a sprint. A BIG thank you to Linda of Calling it Home for orchestrating the event and putting together such a stellar group. Six weeks seems to always fly by in the blink of an eye. I am thrilled with the end result being a fun, functional and fresh room for my family to enjoy. See it for yourself and enjoy the many divine details. See my ORC WEEK 1, WEEK 2, WEEK 3, WEEK 4 and WEEK 5 if you are just tuning in. Gallery Wall and Shelf Art – Sally King Benedict, Kate Long Stevenson, Teil Duncan, Kate Waddell, Haley Mitchell, Jenny Andrews Anderson, Lulie Wallace, Caroline Boykin and more. Lowes’s for so many supplies such as lightbulbs, hanging materials and my new allergy Dyson vacuum. I HUGE thank you to my many sponsors and brands that helped make this happen. I also owe much thanks to the lovely ladies in my office for dealing with all the details while I was working with clients, going to HPMKT and gallivanting around the globe. My project manager, Pam, deserves lots of credit! My pal, Margaret Fisher Interiors, also came in to help style the shelves last night when I ran out of steam and needed another well trained eye to edit. Photography by the talented Mekenzie France. Be sure to check out my friends AMAZING projects too. Gorgeous, gorgeous art! Well done! Brilliantly done! Love the vibrancy and fun. Oh the good memories that this room will hold! Congrats on a fabulous room! I am loving all this color and that sofa! Need I say more. Love what you’ve done in just six weeks, perfect. Fabulous! The purple sofa, black trim, etc, remind me of Bailey Quin! Man oh man…you did not disappoint with all this AMAZING COLOUR!!!!! It’s just so bold and playful and whimsical and fun. I can’t imagine anyone wouldn’t feel happy hanging out on that space. Absolutely adore all of your art…there are so many incredible pieces…my favourite being the Juniper face- so so good. My favourite element overall is probably the antelope- absolutely love that you ran it wall to wall. The whole space is so well curated and such a beautiful mix of pattern and colour- amazing job!!!! I wasn’t so sure when I saw your design board, but lady you knocked it out of the park. My absolute favorite of the 20 ORC! Congratulations! Holy wow….I was so excited to see your space, and man was it worth the wait!! 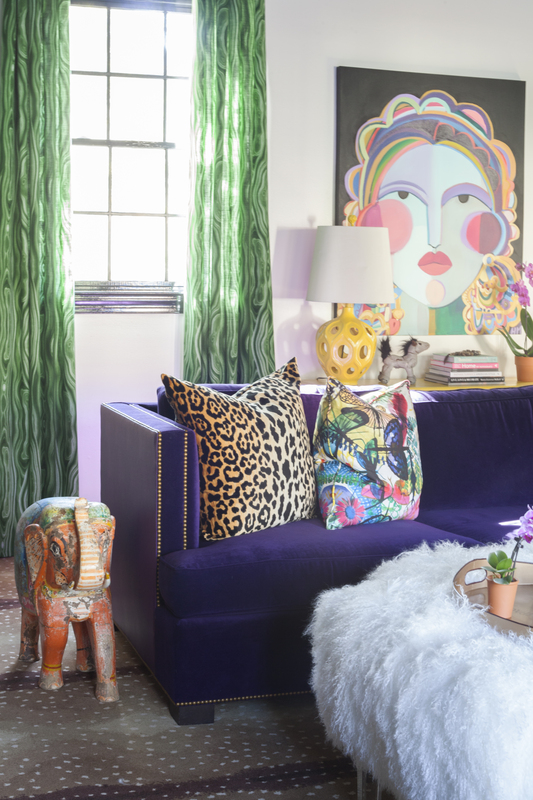 You have such an eye and knack for mixing perfect colors and patterns…so vibrant and fun. I want to come hang in that room and eat all the sausage and drink all the beer!!!! Great job!!!! Oh wow! I love your ability to embrace color and pattern. And such great layering. So fun to watch this unfold. Congrats. Ridiculous! This is such a spectacular concoction of color, function and art; I want to live in this room. Holy heavens this room is amazing. So lush and just plain fantastic. Its screams high end. Your ORC reveals never disappoint. I dont know what to love more..its all such a sight ! Have Mercy!!! I LOVE this space & have been looking forward to see this reveal. Your use of colour, pattern & texture is total & utter perfection – like a sophisticated acid trip & I mean that in the coolest & most complimentary way. Bravo!!! Your design is amazing! You must have had a blast shopping. Everything works so perfectly together. Congratulations!!! Oh my, everything in this room is a show-stopper! What skill to put it all together in such a harmonious way. The art is incredible, and I would very much like to have that yellow table for myself. Just a fantastic sight! kerplunk! The sound of me falling to the floor . You simply killed it!!! Your use of art and color is perfection! Holly, it’s perfect! The family can get crazy and it also looks amazing. I love all the pops of color. You, your team, your friend…whomever…created a fun and beautiful space. Great job. Amazing! Your attention to detail is fantastic. Such a fun room. What a fun and vibrant space. I love the colors and patterns. Such a great mix. Bravo! WHAT a fun room!! LOVE all your art, that you went bold with the dark ceiling, and just overall rocked it out! Congrats on a beautiful job! This is stunning! All of the colors in this room are amazing! When I first began decorating my home I did a lot of neutrals because all of the colors scared me. I have not settled into adding bold colors and patterns and love to see a fellow pop of color junkie! I also did the One room challenge and put in a ton of colors in my boys bedroom. I love everything about this room you did! Hot damn, your space is on fire! I love it….all the color is gorgeous! Wow! What a happy place! You mix colour and pattern so well. Love the Tonic Living drapes and your Karastan carpet is so good. Congrats!! I have been looking forward to this reveal for weeks! I adore your sense of fun and playfulness pulled off in such a sophisticated way. The colours, textures, patterns, are stunning. Love love love. Holly! This is amazing. You are so flipping talented and you have officially sent my need for a Hayley Mitchell face into full blown overdrive! INSANE!!! Seriously you are off the chain on this one and I keep going back and looking through the pictures finding MORE things I love/want!! You know you have a gift and I am so glad you do what you do!!! Next pic I want see is of the family all laid out watching a movie!! Beautiful room, I especially love the ceiling!! Spectacular! So very artful and alive! On behalf of everyone at B E R N H A R D T, thanks so much, Holly, for including Salon Buffet in this amazing interior. What talent! Wishing you, and all your readers, and all those you serve, joy and comfort! I love every single thing about this room. Everything. It looks amazing. So bright and beautiful, what a fun space! Amazing! This is such a fun space! I love all the layers of color, pattern and texture. The art is striking. And that velvet sectional and with the leather chairs and furry ottoman is perfect! Well done! You certainly know how to play with colors…stunning room! I would love to see the rest of the house. Holly, your room is over the moon cool as s**&t!!!! I am in love with the purples used as well as all of the colorful art. The white accents really allows the colors as well as metallics to pop. Beautiful job. c.
Holly, your room turned out amazing! This is really great work! I am pinning quite few of your photos, because I do not want to forget the details. Positively stunning! I love the purple sectional and with the black ceiling it feels so cozy and makes the chandy pop! Beautiful, beautiful room! So beautiful and colorful! I love how playful and fun your designs are. I adore all the art (I look forward to investigating the large face artist!) and just loved the wallpaper, the styling and your fabric choices. COngratulations on this beautiful room! Kudos to you for creating such a happy,, colorful and art-filled space! I’m so inspired!! Holly, just catching up on my reading and had time to really take this in! Great job my friend! Love it all!!! Holly, absolutely stunning!! Love the color the art and artful accessories! Oh. My. Wonderful. I love all this color! What a beautiful, fun, vibrant ORC. I love it all. That peacock chair is absolutely the bomb. So much attention to detail. It’s a really unique room, love the statement it makes. Congratulations! As always, your room never fails to disappoint, lots of color and pattern but all together make a fun and beautiful space to be in! Goes well with your fab Dining room!